Courtesy of The Harvard Archives General Education 105: “Literature of Social Reflection” was taught by Dr. Robert M. Coles ‘50. Before Michael H. Brown '83-'84 and Alan A. Khazei '83 founded the education non-profit City Year, which supports students at risk nationwide, they were just two students among hundreds enrolled in one of the most popular classes at Harvard during the 1980s and 1990s. The course was General Education 105: “Literature of Social Reflection,” taught by the magnetic Dr. Robert M. Coles ‘50. Coles connected literature with social activism through the works of authors like William Carlos Williams, Flannery O’Connor, Raymond Carver, and Charles Dickens. Through the practice of reading, he encouraged students to step outside of their own perspectives and consider the plights of others. For Brown and Khazei, who were roommates at the time, City Year began with passionate, late-night conversations about public service —conversations inspired by Coles’ lectures. Coles, a prominent child psychiatrist, social theorist, and Pulitzer Prize-winning author, stopped teaching the class in 2001 and retired not long after. A literature class as large as his, which saw enrollment numbers as high as 850, hasn’t existed at Harvard since. Computer Science 50: “Introduction to Computer Science,” Harvard’s most popular class last fall, has now claimed that cult-like reputation. 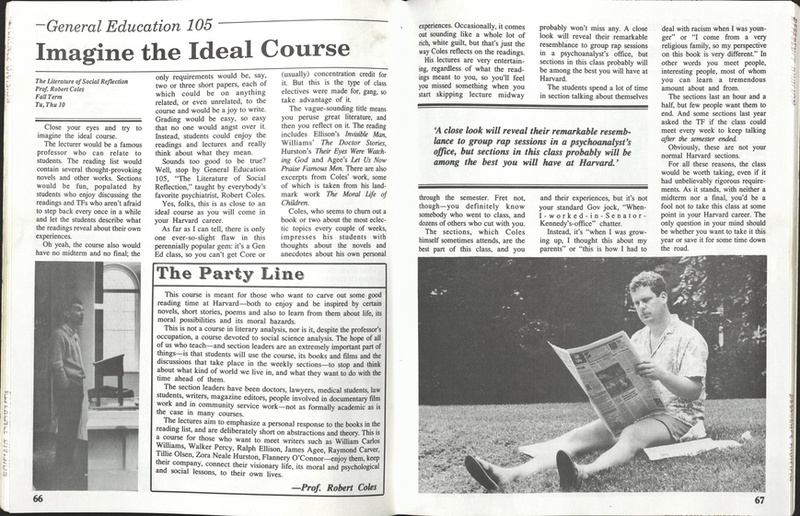 While students flocked to the course for Coles’ inspiring lectures, they were also certainly attracted to his leniency: he was “not interested in grades, or tests, or requirements, or any of that piddling stuff that other professors seem to get off on,” reports the satirical, Crimson-produced “Confidential Guide” of 1988. English Department Director of Undergraduate Studies Stephanie L. Burt ’94 — who shopped the class as an undergraduate — emphasizes that large lectures, while advantageous in some cases, may not be the best prototype for the humanities at Harvard in 2019. “We are aware of the success that Robert Coles’ class had in the 80s, and we are committed to teaching that looks at questions of social justice and inclusion, but I don't think that that course is a good direct model for Harvard College 2019,” she says. This is partly because of what she views as a shift in the role of lecture classes in an age of lecture recordings and flipped-classroom teaching, an approach driven by greater instructor interaction. “Students are more likely to want some other kind of experience than being in the largest possible room, to see the most charismatic speaker,” she says. “My focus and my interest has been on more professor-student interaction, rather than on trying to build up lecture classes that are as large as we can make them.” For example, the department recently expanded its Creative Writing program to meet the high student demand for small workshop classes. Coles, now age 89, did not respond to a request to be interviewed for this article, but he responded to Custodio’s editorial in a Boston Globe interview published the same year. Burt feels that “you could design a course with the same goals [of social reflection] in 2019 and quite easily set it up so that there's not one dominant perspective among most of the authors,” she says. She points to Professor John W. Stauffer’s lecture class English 175D: “The Rhetoric of Frederick Douglass and Abraham Lincoln” as an example of such a course. Stauffer states that Coles’ class served as inspiration for his own teaching. The spirit of “Literature of Social Reflection” still exists, in an evolved form, on campus — albeit in smaller classrooms. Like other literature courses today, Stauffer’s class doesn’t sees the enrollment Coles’ did. These financial pressures are a partial explanation for the decline in the number of English concentrators at Harvard and nationwide, but Burt doesn’t believe that offering a course that exposes 850 students to literature each fall would suddenly alter that trend. Yet sometimes those classes leave unexpectedly deep legacies, whether with the founders of City Year, or with Custodio, the writer of the 1989 Crimson editorial criticizing Coles’ class. Custodio, now a 10th grade English and journalism teacher, has borrowed works from Coles’ syllabus for her own class. “The Raymond Carver short stories have stuck with me. Tillie Olsen, ‘I Stand Here Ironing’ has stuck with me. ‘The Moviegoer’ by [Walker] Percy, and ‘Let Us Now Praise Famous Men,’ and ‘Invisible Man,’” she recalls. Though she says she stands by her prior criticism, she emphasizes that she was — and remains — a proponent of Coles’ focus on empathy, even if she felt his approach was imperfect.